The City of Raleigh has been a Periscope™ user since early 2009, and over the course of this period, the City has added a number of new capabilities to assist them in their goal to continuously optimize their use of energy. In addition to Periscope’s standard dashboard features for their facilities network, the City has added extensive Solar PV monitoring as well as their entire Electric Vehicle charging network to their existing Periscope visualization and analysis capabilities. The addition of the City’s informational kiosk at the Raleigh Convention Center is the latest project deployed in their efforts to better communicate their energy and sustainability objectives to both their constituents as well as the numerous organizations visiting the convention center annually. Challenge: Monitor multiple PV & EV sites across the city, and display relevant sustainability data in an online kiosk accessible to everyone. Raleigh has multiple solar arrays on different sites; two owned by the City, three by private investor-owned third parties on leased property of the city. Each has separate and different monitoring software that generates data related to the solar production. 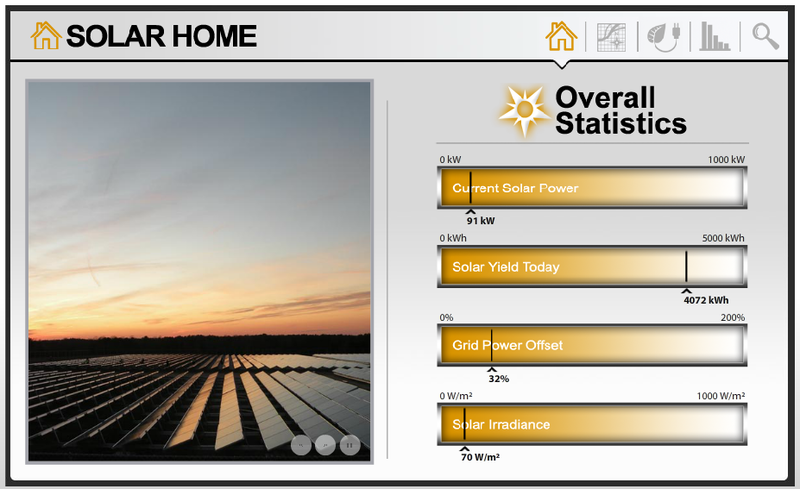 The City wished to show the individual sites as well as aggregate the data to show total renewable power generation. The City wished to have an internet based kiosk with an interactive touch screen monitor at the Raleigh Convention Center and that the same information be shared through the City web page or distributed via links to interested parties. • Each solar array, regardless of size and location must be able to be monitored individually and all sites collectively from a web browser. • Each solar array will be defined by location, size (kW) and annual kWh production. • The system should be able to monitor current energy production from each site and current energy production from all sites combined, daily energy production from each site and from all sites combined, cumulative historical energy production from each site, cumulative historical energy production from all sites. • The system shall be able to monitor and display environmental data, including temperature and cloud cover. • The system will be able to show environmental savings including greenhouse gas offset, representative savings in oil, coal or natural gas as well as educational information related to comparative amount of power generated that would typically serve “X” number of typical households for each specific system and collectively for all systems on a daily and cumulative historical basis. • The system will be able to compare the electrical use of each facility to the solar energy generated, (percent of electrical use and/or value of power generated) as well as cumulative amount of solar generated power of all sites to the total electrical power use by the City, (percentage and/or value of power). • The system should be adaptable for expansion to include additional sites and potentially different environmental or system information. • The system shall be secure in a public environment from both a physical and technological context. To deliver the functionality required, the City hired Activelogix LLC, a Charlotte technology firm specializing in development and delivery of products and services for identification and optimization of energy and sustainability programs. The firm’s flagship application, Periscope™ was chosen as the framework to deliver the kiosk functionality. The City was already a user of Periscope, which provides user customized visualization of current energy utilization across the City’s facilities, including multiple structures, solar sites, EVSE stations and more. Adding the custom kiosk functionality was simply a matter of defining the data needed for visualization, selecting a compatible touch screen platform and developing a couple of custom views to show air quality and solar irradiance. • General Overview of Kiosk Functionality. • An Overview of the City’s Solar Array Sites including total current production; current and historical production by site; GIS coordinates of all sites plotted on user searchable map; Energy equivalencies in units of kW, $$, CO2 and BBLs of oil; ranking of sites based on production (kWh); and individual site analytics, for current period or any user selectable timeframe. • Real-Time View of the Solar Irradiance, its Generating impact on the Solar Arrays and the resultant avoided CO2 . Also shown on this tab is the current City Air Quality. 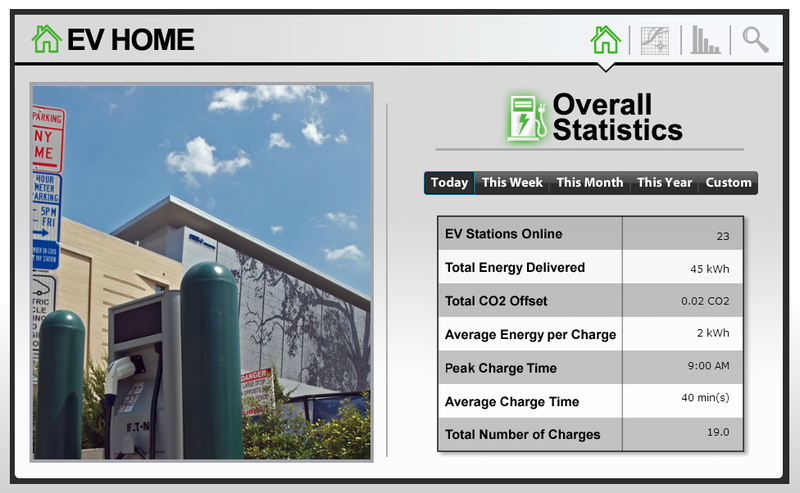 • Overview of the City’s Electric Vehicle Network of 23 EV stations, including summary statistics for energy distributed and offset CO2; GIS coordinates of all EV stations and their status/availability plotted on user searchable map; real-time ranking of all EV stations w.r.t. power delivered, connection time and system uptime, and individual site analytics, for current period or any user selectable timeframe. • An Educational “Green Tips” slide show illustrating in a rotating “Ken Burns” style method, photos and descriptions of the “Green” techniques used in the construction of the Convention Center. • A six minute video of “Sustainable Raleigh” describing in more detail the numerous initiatives the City has undertaken in recent months to reduce energy, improve the environment and enhance the quality of life for the city’s residents. The interactive kiosk was installed and has been operating since February 2012. It has been shared with multiple agencies and will be made available on the City web page in the future. The Sales and Marketing staff of the Convention Center were actively involved in the design and they now profess to have a tool to describe not only what is on their rooftop, but all the solar and sustainable initiatives in the City. The casual visitor to the Convention Center, whether a longtime or new citizen of Raleigh, or the visitor from out of the City, State or Country has access to real time solar power production data and Sustainable Raleigh information.